The San Gabriel Mountains National Monument, created by President Barack Obama in 2014 and placed under review in April by President Donald Trump, would likely remain in place, but could potentially shrink, under recommendations submitted to the White House today by U.S. Interior Secretary Ryan Zinke. Zinke told the Associated Press earlier Thursday that he was not recommending the elimination of any of the national monuments under review, but some of them might be reduced in size. He did not provide any specifics. A summary of Zinke’s report released by the Interior Department also did not give any specifics about the recommendations. His failure to publicly reveal any details of his recommendations earned him rebukes from some Southland Democrats. Trump’s executive order in April demanded the review of monuments designated since 1996 under the Antiquities Act of 1906, which grants the president authority to declare federal lands of historic or scientific value as national monuments. Zinke’s report concurred with the need for the study, noting that the Antiquities Act had been used by presidents 26 times since 1996 to create monuments more than 100,000 acres in size. 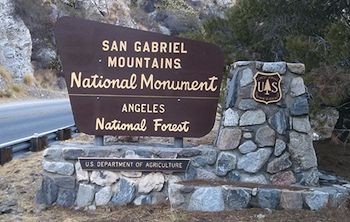 Obama created the 346,000-acre San Gabriel Mountains monument northeast of Los Angeles via executive order. Rep. Judy Chu, D-Pasadena, had originally pushed to have 600,000 acres of the mountain range declared a national monument, but never gained traction for the idea in Congress. Some Republican lawmakers criticized Obama’s action at the time, saying it would restrict access to public land and have a negative impact on water resources, flood control facilities and roads. Chu also lashed out at Zinke for failing to publicly disclose specifics of his recommendations, and indicating only that he was suggesting size-reductions for a “handful” of the monuments under review. “At the behest of oil companies eager to drill in protected lands, Donald Trump ordered a review of 27 of America’s most beloved national monuments,” Chu said. “Now, after visiting just eight of them, Secretary Zinke is ignoring the outpouring of public support from 2.7 million Americans and recommending that an undetermined number be altered. Zinke’s recommendations will be reviewed by Trump, who will have the final say over any possible changes. Some environmental groups have already indicated they would file legal challenges to any effort to change the boundaries of any national monuments. The GOP proposal specifically targets Medicaid, the biggest provider of health and behavioral health services in the country, by eliminating the ACA requirement that Medicaid plans cover an Essential Health Benefits package and cutting federal funding by setting a limit for federal reimbursement per enrollee, also known as a “per-capita cap,” no matter their need for care. Weakening coverage requirements and limiting the amount of funding provided to deliver services would hurt the ability to qualify and access Medicaid, especially for those with time-intensive and often costly substance abuse and mental health disorders. Under the GOP plan, a child treated through one of Pacific Clinics school-based mental health programs could potentially lose their Medicare (Medi-Cal) coverage due to budgetary constraints and lose access to care. Many of the children and young adults we see will consider, attempt, or complete suicide. This is the third leading cause of death in children between the ages of 10-14 and second cause of death between ages 15-34. This bill would also negatively affect those who get their insurance through the Exchanges. In particular, the Republicans’ proposal to eliminate the ACA’s “actuarial value” protections, which require insurance companies to pay a fair share of the cost of your care, would mean higher deductibles and out-of-pocket expenses for low-income individuals. For the millions of Americans seeking care for chronic conditions requiring many doctor visits including mental health disorders, this is simply unacceptable and could make seeing a doctor unaffordable. Older Americans would also see a big increase in out-of-pocket costs. The GOP plan would allow insurers to increase the “age rating” limits put in place by the ACA and charge older Americans five times as much as they would a younger customer. For the 1 in 5 older Americans who live with a mental health condition, this could mean having to make the difficult decision of going without treatment or going without food. The Republican proposal comes at a steep cost and delivers little benefit for those seeking either mental or physical health care. According to the Congressional Budget Office (a non-partisan entity), under the GOP plan, 14 million people lose insurance in 2018. It would also cut $880 billion from the Medicaid program, which cares for low-income families and the disabled, while cutting $600 billion in taxes on wealthy individuals. While some have argued that the ACA did not directly modify the federal mental health parity protections, it did extend those protections to millions of Americans who did not have them before. The ACA also helped millions of Americans obtain health care coverage they would otherwise not have. It is undeniable that the ACA has been successful in connecting more people with behavioral healthcare, especially young adults, children and their families. The law has had a tremendous effect in our home state of California, for example, where one in three Californians currently benefit from our state’s Medicaid program, known as Medi-Cal. Many challenges still remain for behavioral health — too many individuals do not have access to treatment, there is a shortage of behavioral health clinicians, and the suicide rate, sadly including for children, is increasing. Repealing the ACA and replacing it with the Republican plan would hurt those most in need. We encourage all Republicans to work with us to strengthen the ACA in order to ensure that Americans everywhere have access to the health care they need. Congresswoman Grace F. Napolitano (CA-32) is Chair of the Congressional Mental Health Caucus. Dr. Luis Garcia is Vice President of Quality Care, Cultural Diversity, and Outcomes at Pacific Clinics. No one can say this campaign season has been boring, at least not in the Presidential races. For the first time in a long time, California voters will play an important role in the nominating process, as evidenced by the amount of time the two candidates for the Democratic nomination are spending in the state courting voters. Voting is one of our most important civic duties, and we encourage all eligible voters to exercise their duty and vote June 7. Even if your are discouraged by the tone of presidential campaign, there are other important races and issues on the ballot that deserve your attention. As is our custom, EGP will not be endorsing candidates who are unopposed for reelection, since we believe that their lack of opposition makes the question of their candidacy a mute point. Our endorsement goes to Hillary Clinton (no. 15 on your ballot) as the most qualified person for our nations’ highest office. Hillary Clinton’s credentials as a former U.S. Senator and former Secretary of State and even her role as the country’s First Lady have more than adequately prepared her to be our president. Her support for health care for all Americans going back to the Clinton administration assures us she will continue to expand the gains made by passage of the Affordable Care Act. Her stint as U.S. Senator prepares her to negotiate with Congress on legislation important to the U.S. Her experience in foreign policy as Secretary of State and her acquaintance with many of today’s foreign leaders gives her quick entry into foreign affairs with other nations and the ability to negotiate to the U.S.’s advantage. We respect that she has been a long time supporter of comprehensive immigration reform, and expect that she would push legislation to make it happen if elected president. We do, however, want to urge her to not obfuscate the details of her use of her private e-mail. While she isn’t the only government official to use a private e-mail server, (why single her out and not all the others? ), she does have a responsibility to cooperate and be transparent about her use. Why not Sen. Bernie Sanders? It comes down to we believe she has a better chance to defeat Donald Trump in the race for the White House. We admire Sen. Sanders for his efforts to make our country a better place for all Americans, for raising the level of conversation about income inequality, onerous student debt, the country’s loss of good paying jobs, the shrinking of the middle-class and the influence of Wall Street on Washington, we believe that many of the changes he backs are not achievable. While we find it admirable that he wants to shake up our present financial and educational systems, the Congress, our judicial system including the Supreme Court, it seems to us that he is unwilling to accept that those same systems, as well as our states, will have a lot to say about what he is proposing. Yes, at one time in California, a college education was nearly free. But college presidents didn’t earn million dollar salaries like they do today and colleges did not cost as much to operate as they do today. We admire Senator Sanders for trying to level the playing field for all of us, but we believe Hillary Clinton can better negotiate with the Congress to accomplish that goal if elected President. In our prior endorsement of Rep. Loretta Sanchez (no. 114 on your ballot) we stated that we believe her legislative credentials are far superior to any other candidate for U.S. Senator. Twenty years in the Congress gives her the necessary experience in foreign affairs, homeland security and other issues that the Congress will address in the coming years. One other important virtue we believe Loretta Sanchez has is that she is a Southern Californian, and we believe the ideal balance is to have one Senator from the southern half of the state and the other from the north. Why not Attorney General Kamala Harris? Attorney General Harris has proven herself to be a good litigator, but lacks the experience needed to be a good legislator. 34th District —Xavier Becerra – the first Latino to serve on the House Ways and Means Committee. Becerra has used his position to increase opportunities for working families to improve social security programs for women and minorities, to help the working poor, strengthen Medicare and ensure its long term viability. He has dedicated himself to promoting issues affecting industries critical to the Southern California region in health care, high technology, entertainment, free and fair trade. His continued tenure in the Congress is important to all Californians and our influence in the nation’s capitol. 40th District —Lucille Roybal Allard is the first Latino to serve on the House Appropriations Committee. She is the ranking Democrat on the House Homeland Security Appropriations subcommittee. Roybal Allard also serves on two other appropriations subcommittees Labor, Health and Human Services and Education Subcommittee. Roybal Allard’s position on the House Appropriations committee has led to many federal projects that have created jobs for her district and Greater Los Angeles, among them; A New Federal Courthouse for the Central District of California Los Angeles Division; The Metro Gold Line Eastside Extension; Deepening the Port of Los Angeles to increase jobs and international trade for Los Angeles; Repairing and maintaining sewer and water systems; Preserving historic structures and culture facilities; Federal funding for local community health clinics. Allard also authored legislation to require life saving screening of newborns and to prevent under age drinking. She led the introduction of the Health, Equality and Accountability Act of 2014, a blue print to achieve health equality among all populations. Roybal-Allard understands the importance of staying connected to her diverse constituents, and makes it a point to spend time in the District listening to the people she represents. Grace Napolitano – is the most senior member of the U.S. House Committee on Transportation and Infrastructure. Napolitano currently serves as the top Democrat on the Subcommittee on Water Resources and Environment, which oversees EPA’s Clean Water Act on the U.S. Army Corps of Engineers, a boom to the state of California. As a conferee to fixing America’s surface transportation (FAST ACT) House and Senate Conference Committee, she was able to procure major victories for the state, which will receive over $26 billion for our crumbling roads, bridges, and transportation systems; $450 million a year for the Los Angeles region alone for transit. She introduced H.R. 241 the Water in the 21st Century Act to provide grants and loans for conservation, water recycling, groundwater and storm water and water infrastructure projects. She is the founder and chair of the Congressional Mental Health Caucus and assisted in securing mental health in the Affordable Care Act. During her tenure, Napolitano worked with former President George W. Bush and the Congress to reauthorize the Voting Rights Act of 1965. 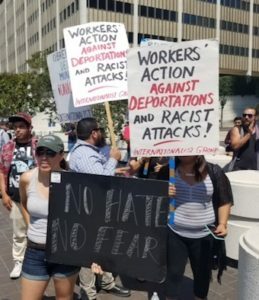 She also fought for a Democratic immigration over haul proposal that would have created a guest worker program, a path for citizenship for undocumented immigrants. Her leadership on mental health and water related issues have improved the quality of life of Californians. 63rd District – Speaker Anthony Rendon has served and chaired the Water, Park and Wildlife Committee. He assumed the role of Speaker of the Assembly on March 7, 2016, and has since demonstrated an openness to listen to constituents on issues before the Assembly, Rendon also authored Proposition 1, a $7.5 billion state water bond passed in November 2014 by the voters. 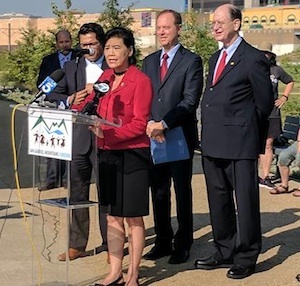 Rendon also authored AB 530 in 2015, which spurs revitalization of the lower portion of the Los Angeles River and AB 496, which connects schools with resources to improve clean drinking water infrastructure. As chair of the utilities and commerce committee, he led the effort to ensure accountability of the California Public Utilities Commission. Rendon has earned our endorsement. 53rd District – Miguel Santiago was elected to the assembly in November 2014, and while he hasn’t been in the legislature long enough to have a large record on legislation we find him a straight forward politician whose efforts on behalf of his district should give him a long record of accomplishment in the future. We appreciate that he has been a constant presence in the battle over Exide, attending the meetings and hearings that few of his counterparts in the Legislature have found time to take part in. The city of Montebello has decided to seek voter approval to sell the city-owned water utility, the Montebello Water System. The city has had to subsidize the system that only serves about 1,600 ratepayers, only eight percent of the city’s water customers. In doing so, they have taken money that could have been used on services for a larger share of city residents and businesses. What is being sold is the physical infrastructure; the city will retain its rights to pump water from its aquifer. The infrastructure needs an estimated $50 million in upgrades and maintenance, money the city just does not have. Montebello officials want to sell the water system for $14 million to the San Gabriel Water Company, which already operates a portion of the system being sold, so it is not an unknown operator. The sale makes sense given the city’s precarious financial situation and the prospect of another round of large budget deficits. It makes no sense to continue to pour money into a system that the city had no ability to improve, which will lead to further deterioration and lowering of its value. We recommend that the city use great prudence and transparency in what is does with the money generated from the sale. The best plan may be to earmark the sale revenue in a special account to close any future budget deficits.